A military is the most significant tool of a nation’s foreign policy, and (hopefully) the tool of last resort. Yet the control a civilian leader has over the military is, in many respects, an encumbered and fractured control. The military’s organizational culture, role in society, size, and considerable autonomy are potential obstacles to true civilian control over the military even in peacetime. A brief but historically informed text intended for students of the presidency or national security, Governing the Military addresses the gamut of challenges a new U.S. President faces as commander-in-chief. Andrew L. Stigler is Associate Professor of National Security Affairs at the United States Naval War College. Crisply written, interesting, and enlightening, even for those who consider themselves well-versed in these matters. 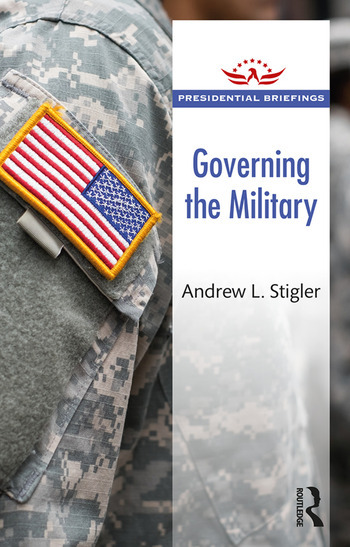 Stigler digs into the most important military topics and offers sage advice to future presidents and interested laymen alike. A wonderful little book.